"Dumbbell," as in, "I'm a dumbbell for not moving to California." My friend lives in Santa Clara. 70s all day, every day. Can't argue with you. I'm moving there in two months. Bill, does that mean the end of the MF site when you move to California? Trying to decide if driving out to Eastern South Dakota this afternoon (leaving MSP at 4PM) and returning around 8PM tomorrow night would be safe or just fool hardy. Possible of rain turning to ice tonight? and when should western MN expect snow and blowing to start tomorrow night? Did anybody get snow this morning in the Metro? The NWS seemed quite confident of a slow morning commute, but no flakes fell here in the Burnsville area. Don't get me wrong, I don't want a slow commute. It's just that the prediction was for an 80% chance of a snow burst lasting 1-2 hours to come through around 5-7 a.m. It never happened here. They are saying the same thing for late this afternoon. No apparent snow this morning in St. Paul. Yup, no snow in and around the metro this morning. I know he wasn't the only but Mr.Novak did warn us of a slow commute this morning due to a snow burst, now the snow sailed northeast of the metro but I bring this up because on the last couple of threads most of you gushed on how Novak was the best thing since slice bread. Yes I follow Novak and he is very knowledge and passionate about weather, but he too makes mistakes and misses forecasts and at times the hypeometer is too high, so remember that for the next time. I like Dr. Novak too, but I must agree that he missed this morning's forecast for snow and a slow commute. My significant other had an appointment this morning and thus purposely got up an hour earlier than usual in order to give her extra driving time in the snow. She woke me up this morning asking me where the $@#!& snow was. She's not a morning person! Fifteen hours ago Dr. Novak posted on Twittter to expect a slow commute this morning due to snow that was supposed to develop after midnight. To be fair, the snow did develop, but it developed north and east of the metro. It seems to me that Dr. Novak and many other mets have rather struggled at times this season with predicting snow even less than a day before the event is to occur. The national weather service was calling for an 80% chance of snow last night/this morning. They struck out with their forecast too. The forecast for this evening is for an 80% chance (NWS) of an inch or so of snow in the metro. We'll just have to wait and see what happens. It's just taking me too much time to track everything. Honestly, I can't keep up. That said, I did hear some say 3-5" over the next few days last night. I think we can all agree that overall the great majority of times snow amounts are over predicted, and this includes everybody: local mets, Dr Novak, the NWS, and not just here but all over the country. The local NWS in Taunton, Ma predicted 8-12 inches for Boston a few days ago and i stead the storm only produced 5". Paul Douglas says it is an unwritten law of mets to over predict snow as he thinks it is better for the public than having people stranded in 1 foot of snow when you predicted 2 inches. I am not sure if that is true, but as a statistician who tracks these things I can tell you there is overwhelming evidence of over rather than under prediction over the last 10-15 years. They've already called off school here in Rochester for Monday! I wonder if schools in the Twin Cities will be canceled both Monday and Tuesday. The high temp both days will stay well below zero, and several forecasts are saying lows of colder than -20. Beyond this, we're looking at below average temperatures for the foreseeable future. The only saving grace is that it looks like we might get a bit less snow than Novak was saying, unless he's right again, which he probably is. If I could, I sure would! NWS has a winter storm watch out for south central MN for Saturday evening/Sunday. That includes strong winds and 3-4 inches of snow. It appears that the NWS thinks the heaviest snow will be far south of the metro, as opposed to through the metro like Dr. Novak is showing. Time will tell. I would guess December 2010's dome collapsing storm would be the last Blizzard Warning for the Twin Cities metro area. We had that warning here in WI and that was our last one. I think I remember seeing a ton of orange on the warning maps so that is my best guess for the last one. At best, most of the areas that don't see a Blizzard Warning will end up with a Winter Storm Warning or a Winter Weather Advisory for the expected blowing snow and rapid temperature drop expected. Models ended up being too far east with the snow band this evening and ended up dropping most of it just west of the border. While it will be interesting to see this blizzard unfold, this pattern continues to bore me. Pretty tired of the sub zero highs. I'm pretty sure there wasn't a blizzard warning for the core metro during the Dec. 2010 storm. A ton of snow to be sure, but don't think it qualified. Winter storm warning for the Twin Cities; blizzard warning for areas SW of the metro area. GFS has 3.4, NAM has 1.7 so the average is 2.6, then you discount by 70% to get around 1.8 inches. do not have access to qpf output from ecmwf, if somebody does we can refine the common sense forecast. Looks like NWS's latest graphic on their Facebook page puts the heavy band well south of the metro. Only 1-2 inches for Mpls. Quite different from Novak's 4-8, and recent 4+ band over the heart of the metro. I'm curious to see which pans out! Also, their latest graphic doesn't seem to make too big of deal about blizzard conditions in the metro either. Looks like the ECMWF is around 2.1" with the heaviest band going though the Red River Valley. Some of the long range stuff is interesting. 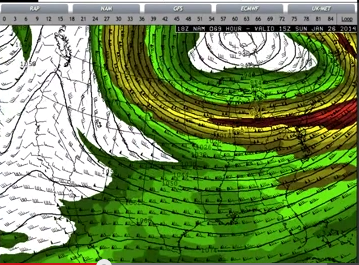 Pattern tries to flip to a trough in the west. I'm thinking February won't be as bone chilling but much snowier. Trough in the west means storms can come from the SW = more moisture = big storms. Now if one actually takes the right track...we'll see. Minnesota River Valley not Red River Valley. Sorry I'm tired lol. Can someone tell me how two neighboring NWS offices(MSP and Lacrosse) have two totally different snowfall graphics for the same area.They look at the same data and I know they even communicate with each other.....yet when looking at their graphics for the so-called blizzard coming MSP calls for 1-2" for the Twin Cities and Lacrosse calls for 3-5" for the Twin Cities.....very confusing,who do you believe? Nevermind....... both offices have updated their graphics so if you didn't see it you wouldn't know what I was talking about. New graphics do not contradict each other anymore. Nearly -23 being forecast for Monday night/Tuesday morning. Does somebody have a book that can look up the last time it was THIS cold in the Twin Cities? January 6th, 2014 with a low of -23 at the airport. Interested to see if Gov. Dayton closes all schools again Monday. Certainly looking just as cold as it did earlier in the month. @CWY2190, they've already officially said he will NOT close them unilaterally again, that two weeks ago was unique coming off a break for most districts. Most school districts will close on their own, and decisions will likely be made by Sunday evening. For you research buffs......its pretty much a lock that January temps will average below normal which makes it two months in a row......question is when was the last time that happened?.....three months in a row? March and April 2013 were both below average. Last time that at least three consecutive months were below average (both highs and lows below average) was Feb-May 2008. (According to my data anyway.) In fact, pretty much the first half of 2008 was cooler than average. Radar is reflecting the snow shield sliding southwest of the metro. Is it supposed to shift east? It will snow east, but the heaviest snow bands will be south and west of the metro, highest totals will occur there not over the metro core like Novak's 4+ map indicates. At least its snowing but as Duane alluded to earlier this pattern may be fascinating to some to watch but its pretty boring to track 1to 4 inch snowfalls, can someone please send a Domebuster storm our way please. February will be more interesting. Looks like we try to set up some ridging over the SE and a trough over the west. At least that would open us up to a Colorado low or Panhandle hook. Watch it be so cold still that they all track south of us. Or better yet...and way too damn common in recent memory...we'll finally get a southern storm and it will be too warm for all snow. I'm in Roseville. Can't sleep so I looked outside; I can still see my footprints in the driveway from Saturday morning. It stopped snowing around 3:20 according to a MNDOT sensor near me. I don't know how much snow we got here, but I would be somewhat surprised if the city did any plowing. A solid 3 inches here in Apple Valley/Rosemount overnight. How did everybody else fare? Maybe slightly over 2 in Mpls? Very nice morning out there. Already got it plowed. No wind. Very calm. Roads are pretty good. What's the biggest snow we've had this season @ MSP? Is it only 4.4 inches? Kinda strange to almost be in Feb and not have had at least a 5 inch storm. Yet were still 9" above average since Dec 1 and at average since July 1. Those clippers add up. As CWY2190 alluded to clippers do add up. MSP total was 3.4 from last night/this morning, that puts MSP 1.6" above average now even after a very slow November and almost double where we were at this time last year and we all know how long snow continued to fall last winter/spring. 2" in Golden Valley......now I appreciate the fact were getting snows but my bro is on my tail for our snow competition, I need some heavier storms to hit our area....some are saying February will be a better opportunity for us, I hope so! I was wondering how the competition was going. Looks like a tight race this year. As of today...I'm ahead 37-31(but he has the 20pt spread).....looks like a close one this year! If you can hold your own through February, you can make a good stretch run in March (and April, if like last year). It's gonna be a horse race! Expanding the blizzard warning was the right call. Central Carver County has had sustained winds of 33 mph gusting to 45 for a couple hours now. MnDOT has the entire metro area listed as hazardous driving conditions. Chance the NWS expands the warning further east? It looks like the core of the strongest winds is moving SE thru IA and NE right now. May not get much worse here. Once again, nice job to Dr. Novak on calling for this blizzard days ago and really stressing how dangerous conditions were going to be today. I would say that this system from a wind perspective really lived up to its billing. Many roads continue to be closed across Minnesota due to the blowing snow. The only thing that was off a bit was the fact that the heavy snow band actually set itself up along and east of the Mississippi river in Wisconsin. Not anyone's fault with that one, because even right up to the snow developing most of the short term models had the band further west. More proof that nature doesn't always do what the models say even a few hours before the event. 5.2 inches of snow fell here and quite frankly it was about as perfect of snow making conditions as you can get. Flakes were big and it piled up quickly and was a high ratio snow (very very light and fluffy). It was fun watching it getting kicked up by the winds as I watched it out my patio door. I just hope that people stayed off the roads, and those who had to go out stayed safe. Arctic chill will be around for the next few days with us not seeing zero until probably Wednesday. No major storms in sight now, but we'll be watching a system that could develop and pass by to our south at the end of the week. Not much to it yet, but certainly could evolve into something. After that, we watch for that pattern shift of more troughing in the west and ridging in the east. The coldest air will be pushed just north of the border but not far enough that we won't have to worry about it again. It will be lurking around up there and I imagine any big storm system wouldn't have a problem pulling it south again. Weather service touched on this pattern shift with their overnight Saturday/early Sunday morning discussion. It may be that the main battle zone ends up setting up too far south leaving us back in a lull of a pattern but we'll see. It will be a snowy month for some. Also of note, the more snow places to our south get the more difficult it will be for us to warm come March and April with the southerly winds passing over snow pack and cooling. Certainly something to watch as we head into the month of February. Stay warm everyone! Nice post Duane, attention now really turns to the Feb 4th and 5th time frame. All three models now show a large storm coming out of southern TX dropping heavy snows from OK through southern KS into northern Missouri through IA and the Chicago area. I don't think it can cut up this far north due to the position of the axis of the EPO ridge, that would have to retrograde about another 300 miles or so to the west. However the pattern change that has been talked about looks to be real. Here is the the ensemble mean off the GFS for that time frame, that is fairly impressive this far out, that storm to me looks real. BTW that site updates the GFS ensemble means by midnight. If your a fan of more snow and less arctic air you will be depressed to read, like me, the last paragraph of this morning's NWS area discussion! You guys are never happy. MSP is sitting at 33.3 inches which is for a change above average as of today. Last year we had 17.4 and we ended up with 67. There are 13 inches of snow on the ground. I'll take -15 over snow. The cold weather doesn't impact my commute as much as even a quarter inch of snow; it's safer getting my child to pre-school. There is enough damn snow for winter activities (sledding, skiing, etc. ), so why exactly do you want more snow? Just for bragging rights or what...? coming out of canada of course! Oh don't get me wrong I'm not complaining @anonymous(9:27am).....I definitely am aware of those numbers and love those numbers! @Disco.....totally agree theres more then enough snow to partake in winter activities....problem is you can't enjoy it when its subzero temps or windchills(unless your bundled like the pillsbury dough boy and walk like a penguin). As a snow lover I always want more snow and to track storms and their various solutions that go with them, that fascinates me....and it is no secret that I have talked about a snow competition that me and my brother have yearly which we wage on.....so yeah I need the snow to keep coming, yes it does mess up.commutes but if were comparing -15 and snow....I will take snow everytime over arctic air. It's not so much wanting the snow as much as it is not wanting the cold. I echo bigdaddy's thoughts. I enjoy snowmobiling as well as other outdoor winter activities but it is difficult to get out and enjoy the snow that we have with temperatures constantly being frigid. I do enjoy snowstorms though, and would prefer that they happen on weekends that don't involve a lot of travel. Yeah, someone always has somewhere they have to be but the lower traffic times are usually ideal. I also like the snow because it will at least help some in regards to some drought issues we have across the area. Maybe some lakes and rivers will get a bit more water in them. I would be very curious to see how much water is actually in the snow we have. It seems like most of the snow's source has been from clippers which usually don't care much moisture with them at all. Still need to think about spring and farmers needing moisture for their fields. Frost depth has to be pretty deep given how cold things have been, so the more moisture we can have available the better since the initial melting stuff will likely just run off. NWS not really saying the metro will receive snow tommorrow night(20%) and their graphic keeps any snowfall south of metro.....yet just heard Dave Dahl's radio spot on KS95 and he said 2-4" of snow tommorrow night "from the Twin Cities on south", also Mike Lynch on WCCO radio said "light snow will affect the AM rush Thursdy morning"......so any truth to this?, will we be receiving measurable snow after all? Also whats the deal with Saturday....EURO shows snow with an inverted trough, according to the NWS discussion.....any legs with that one? I havent seen anything that suggests more than just a dusting for MSP tomorrow. Except for Mr. Novak has MSP and points south in his "moderate" travel impact zone, whatever that means! hearing lots of 2-4 amounts south of TC, NAM and GFS picking up on the event with 2-4 and some 4-6 in extreme southern MN. Novak is on a good string as of late and he has a moderate travel impact on wens-thurs snow. would like to hear more discussion on the possible weekend storm. Continuing to watch this system for Thursday. Upper level dynamics not looking all that bad and somewhat of a northerly trend is happening in the model runs. 18z NAM still showing an impressive jet streak to the south, with parts of MN and WI in a favorable area for snow development. At this point it's tracking a surface low across the MN/IA border on east towards La Crosse, WI. An upper level trough moves through as well, which should help to enhance lift across the area. It's still far too early to put any bullseyes down, but this system still is certainly worth watching since it would likely affect the Thursday morning commute. In regards to the travel impact maps, those are mostly for people who will need to go out and commute in this. Moderate simply means that you should anticipate some problems. It doesn't specify amounts or says it will be a huge storm or anything like that. We know that even 1 to 3 inches of snow can cause big issues during rush hour. I have a feeling though, that those "moderate" problems will eventually need to be bumped north a bit if the models continue to trend things to the north. We'll keep on watchin' it! Please leave feedback if you're inclined!